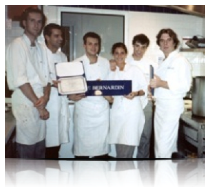 She has worked in the legendary pastry kitchens of Le Bernardin, Gotham Bar And Grill and Alison on Dominick. Alissa has also owned her own full service catering company, and has been creating her own line of specialty desserts for over 15 years. The love of baking has been with Alissa since she was a little girl. Alissa's daughters, Mollie and Sasha, are following closely in her footsteps.